Bearing high the flag of clean energy, ReNew Power Ventures Pvt. Ltd has been one of the key private-sector players driving India’s plans to move towards renewable sources of energy. Not surprisingly, it has attracted a horde of strategic and financial investors, with the latest transaction valuing it at $2 billion, much higher than Suzlon Energy Ltd, the wind-turbine maker that Sumant Sinha quit to float ReNew Power six years ago. But it’s more than the heady valuation it commands that caught the fancy of the eminent jury members for the News Corp VCCircle Awards 2017. The jury, chaired by Arun Duggal, chairman of ratings agency ICRA, picked ReNew Power as the private equity-backed infrastructure company of the year. The firm appears to have cracked the profitability code, posting a handsome operating profit that was, in fact, higher than its operating revenues for the year ended 31 March 2016. ReNew Power’s total income and operating profit have grown at a compounded annual growth rate (CAGR) of 63% to Rs 858 crore and Rs 772 crore, respectively, during FY14-16. The company, which counts Goldman Sachs Principal Investments, ADB, Abu Dhabi Investment Council and Global Environment Fund as investors, has also quickly built a strong asset base with 1.2 gigawatt (GW) of commissioned projects in wind and solar power and a planned additional capacity of 1.8 GW by 2021. While it has a stronger presence in the wind power space, it has been steadily building up on the solar side too. Last year, ReNew Power won almost half of the 1.2 GW capacity up for grabs in a solar power tender run by the state of Jharkhand. Its wind power projects are widely spread across West, Central and South India while the utility grade solar projects are spread across Madhya Pradesh, Telangana and Andhra Pradesh. 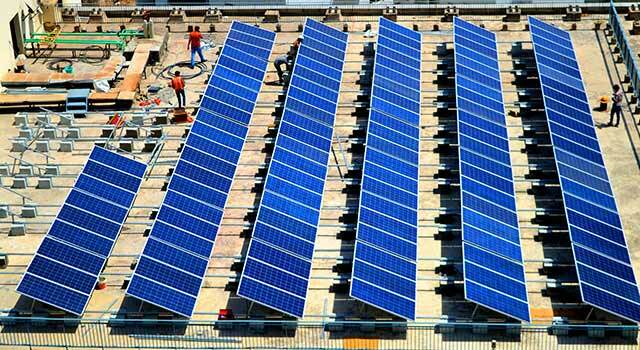 The company also has rooftop solar projects.